This program is an implementation of the classic puzzle Tower of Hanoi! This is my first mostly recursive Assembly program. Any advice and all topical comments on code optimization and conventions is appreciated! I found it confusing to read these comments. Registers R8D and R9D are being setup for the upcoming printf and nothing else. The mention of "update after hanoi call" would suggest they have a more permanent significance which they haven't. The .skip_recursive_move operation for when ECX is 1 on input can be much simpler. All registers are already conveniently setup for the tailcall (jmp) to printf. The program uses the EBP register in a redundant fashion and hence you can shave off a number of instructions. You also no longer need to preserve EBP. Please notice that setting up the calling registers in a consistent order (RCX, RDX, R8, R9) helps to improve readability. Leaving a blank line further groups things into logical blocks. See that this time ESI gives the 'from' peg! Not the answer you're looking for? 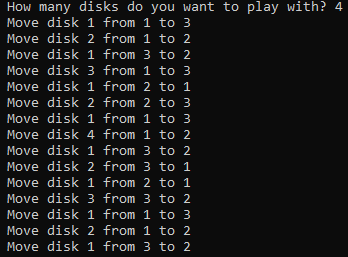 Browse other questions tagged game recursion windows assembly or ask your own question.